The Battle of the Coral Sea from May 4 – 8, 1942 was the first major encounter between American and Japanese naval forces. Prior to the battle, the 1st Construction Battalion Detachment was deployed from Dasiyville, RI on Jan 7, 1942 and arrived in Bora Bora the following month. On the island, the Seabees constructed fueling stations to serve ships and planes that were crucial in the battle of the Coral Sea. A month following the battle of the Coral Sea was the Battle of Midway in June of 1942. The Americans were victorious in the battle, which became the turning point in the Pacific War. American forces continued to advance on the Solomon Islands which were also occupied by the Japanese army. Prior to the Battle of Guadalcanal, Seabees of the 3rd Construction Battalion Detachment were rushed to the island Espiritu Santo in the New Hebrides to build a bomber strip with a time limit of 20 days. Incredibly, the Seabees were able to carve a 6000 door airstrip in the virgin jungle which allowed large scale air attacks against Guadalcanal that won the battle in February of 1943. 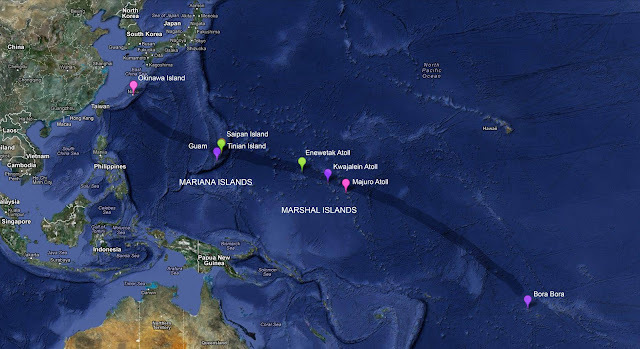 In the American’s streak of victories, the atolls of the Kwajalein, Eniwetok and Majuro were seized from Japan in the first half of 1944. In Majuro, the Seabees built major fleet anchorages and similar aviation facility in Kwajalein. The Mariana and Palau Islands campaign, aka Operation Forager, was the beginning of the end for the Japanese. The Americans were dawning upon Japanese mainland, and the capture of Mariana Islands, Guam, Tinian and Saipan, cut the line of defence for the Japanese, and more importantly the Seabees were able to build an emergency landing field much closer to the Japanese homeland that would service crippled bombers returning from raids and enable shorter- ranged fighter planes to accompany the bombers to their targets. After a long campaign of island hopping, the Americans finally arrived at the foot of Japan, on the island of Okinawa. The Battle of Okinawa began on April 1, 1945 when the main invasion forces landed on the island’s west coast Hagushi beaches. Arriving along the 24th Army Corps and 3rd Amphibious Corps were the 130th Naval Construction Battalion. In the following days, 50 000 Seabees composed of 11 regiments and 4 brigades arrived at Okinawa. From the end of the Okinawa battle in June through August, the Seabees worked non-stop to build ocean ports, grid of roads, bomber, fighter fields, seaplane bases, Quonset villages, tank farms, storage dumps, hospitals, and ship repair facilities in preparation for a final assault on Japanese mainland. While preparations were underway in Okinawa during the summer of 1945, the USS Indianapolis arrived at the newly ceased island of Tinian from the Naval Weapons Center at Port Chicago, California. Components of a mysterious weapon were unloaded, and with the assistance from several Seabees, the weapon was assembled and loaded into a B-29 bomber, Enola Gay. 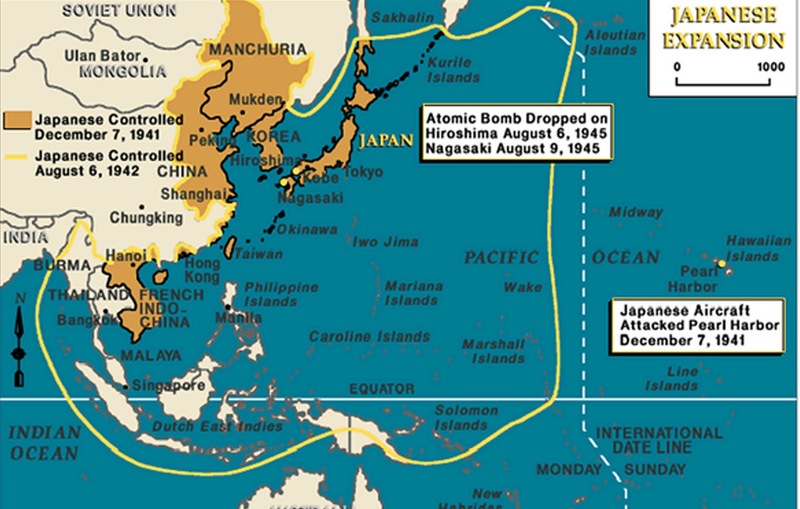 Later that day, the Enola Gay took off and dropped the first atomic bomb on Hiroshima, thus ending the Pacific War.